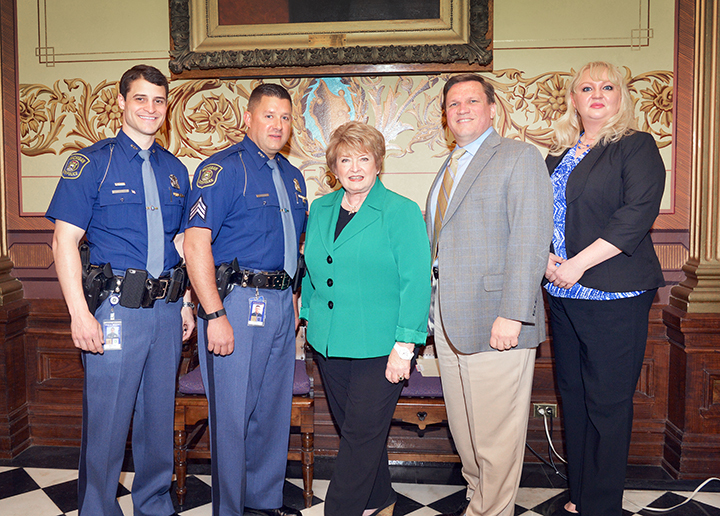 Sen. Wayne Schmidt welcomed, from left, State Police Troopers Matthew Williams and Sgt. Timothy Fitzgerald, Michigan Association of Broadcasters President and CEO Karole White, and Government Relations Manager Elena Palombo to the Senate on Thursday, May 19. LANSING, Mich. — The state Senate adopted a resolution sponsored by Sen. Wayne Schmidt proclaiming May 15 through 21 as AMBER Alert Awareness Week in Michigan. Michigan’s AMBER Alert system was the first statewide alert system of its kind to be launched in the U.S. Started in 2001 as a collaboration between the Michigan Association of Broadcasters (MAB), Michigan State Police, Michigan Chiefs of Police, Michigan Sheriffs’ Association, and the Michigan Department of Transportation, the system helps locate and recover abducted, endangered children within the state. The network is one of the best and most comprehensive in the nation, employing state-of-the-art technology to provide immediate information to the public during an active AMBER Alert. The resolution also recognizes the important contributions of the partnering organizations that work to raise funds for the Michigan AMBER Alert Foundation, which financially supports the alert system. “AMBER Alert is a very effective tool when you add the eyes and ears of radio and television audiences, electronic message boards and cell phone users to the list of individuals looking for an AMBER Alert victim,” said MAB President and CEO Karole White. “Some perpetrators just give up when they hear the AMBER Alert issued. This has been the case in several active AMBER Alerts issued in Michigan. Senate Resolution 178 can be read in its entirety on the Legislature website.